Here’s a little something that I have been working on for you for the past couple of days. 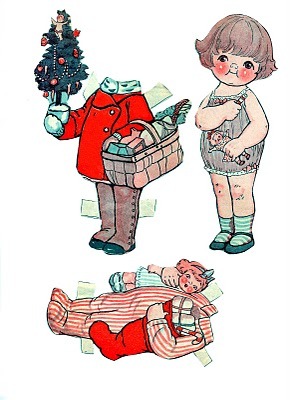 This is an adorable vintage paper doll set with a Christmas theme! What a cute Dolly this one is, and just look at all of her outfits!! She has a red Christmas coat, complete with a tree and basket of goodies, some fun stripped pajamas with a bright red stocking ready to be hung on the mantle, and two cute little frocks with matching shoes and socks. How fun!! Your getting this one a bit early today, as I’m off for a night of fun with the girls. Tonight is our annual Lucketts Store Staff Christmas party. I will be enjoying a fabulous gourmet meal with some of my very best girl (& one guy) friends. Can’t wait!! I’ve sure been enjoying and utilizing all your wonderful graphics and prints. Thank you so much for sharing these. It makes crafting so much easier. Have fun with your friends. Well how cute! I use to love paper dolls as a girl. I can still love them! Have fun! These are just too cute, thank you so much. Once again, THANK YOU! These are great. I may print them as Christmas cards for my Great Nieces. Like my Betsy McCall! Thank you! These paper “Dollys” are the cat’s pajamas! I, I mean Santa, quickly printed them off, rolled them up, and tied them with a Christmas ribbon for my daughter’s stocking! Thank you so much! These are just too stinkin cute! Thank you!!!! Thank you Karen for this wonderful paper doll. I sat last night and cut her out, dressed her and then put her in her pj’s. Brought me back to my childhood. She even brought a smile to my husband’s face (although I think he thinks I’m a little kooky!). This is so cute and adorable, thank you so much for sharing these. Have a very nice Christmas, Petra. Those are so adorable Karen. I have had so many Google problems-and it isn’t over-Google has no idea how to solve the problem. Yes again and it isn’t just the second, third or 4th time-I can’t count any more. Sorry I haven’t been by much-I decided after weeks and weeks of non-stop Google issues, I am throwing my hands up and making much needed visits. I hope you have a Very Merry Christmas and hope you can come by for a visit. I will continue posting, even if it doesn’t show up in the Reader. I’ve been visiting your blog for a few weeks now and this is my first time downloading one of your images. I think I’ll be using it (or something like it) in a fiber art piece I’m working on. So beautiful! Thank you Karen! I love paper dolls! I’m so glad you all enjoyed this one and I’m thrilled to hear that some of you have already printed this up and cut it out, or that you are giving this as a gift!! 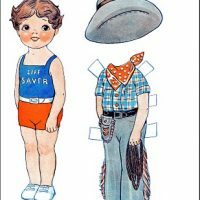 I remember going to my grandparents as a child and seeing paper doll cutouts in one of their magazines. I think it was the Saturday Evening Post? 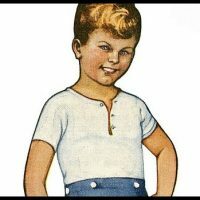 I think the name of the paper doll was “Betsy”? My parents didn’t subscribe to any magazines so it was a treat at my grandparents to view and see these paper dolls. My memory is a little fuzzy. I enjoyed seeing these cut outs again. Thanks for sharing – they would make a cute ornament to hang on a Christmas tree. 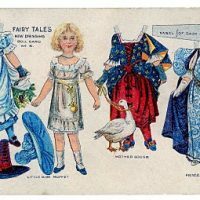 I’m so happy to have found this sweet, vintage paper doll set on your site, Karen. The doll looks so much like my niece. Thank you for this beautiful set. 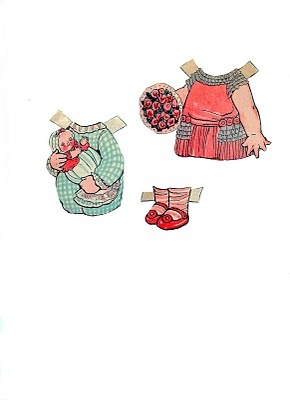 How sweet … I love paper dolls … played with them for hours as a little girl. This brings back fond memories! Thank you for sharing. These are really sweet. I think if the pieces were cut out and the base unit stuck yo the card a youg lady would have a lovely time. (you could use tiny magnets to hold layers in place.Thank you, Narnt.